When I first heard about homeschooling, I was intrigued by the idea of teaching my kids at home. I was impressed with the quality and character of the homeschool kids I knew. But I wasn’t convinced that it would be the best path for my children. At that moment the light bulb came on. A classroom teacher trying to meet the needs of 20 to 30 students could not invest the same time and energy in my children that I could. Homeschooling would be the best choice for my children. 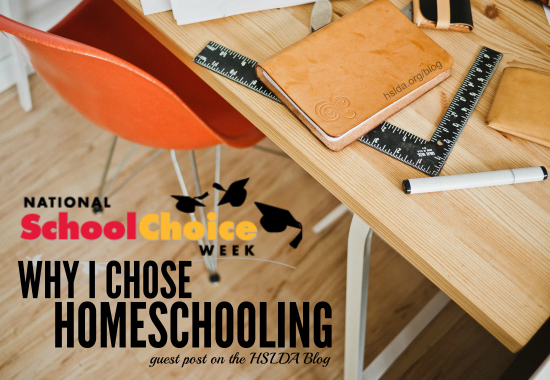 Through the years, that choice has been confirmed as my children and I have experienced the benefits of homeschooling in many tangible ways. When one of my children struggled with learning to read, homeschooling let us spend the extra time she needed to practice her phonics skills. I was able to choose a reading program that worked best for her learning style, taking into account her strengths and weaknesses. And through mutual perseverance—and a lot of hard work—she became a strong and independent reader. Homeschooling also gave my children the time and opportunity to develop their interests. In middle school, my oldest daughter wrote and compiled her own newsletter and sent it to subscribers. One of my daughters performed on a gymnastics team, which developed her confidence and natural gifting. Another child was motivated to write her own full-length novel during National Novel Writing Month. Academics remained an important part of our homeschool. But I also loved being able to take advantage of real life learning opportunities, where my kids could apply the knowledge and skills that they had acquired. In addition, I felt it was important for my children to take advantage of the many excellent homeschool activities in our area. These included a 200-member classical children’s choir, physical education classes, and an art program offered by a homeschooling dad who was also a professional artist. My children made lifelong friends and were often mentored by passionate homeschool instructors who passed along their expertise and love for their subject. I am encouraged to watch my now adult children give back to their communities by offering art, gymnastics, and music camps for children, and leading Bible studies for teens. I can see the fruits of our many years of homeschooling as my kids create opportunities to share their love of learning with others. When I recently began working part-time, homeschooling gave me the flexibility to keep teaching my youngest child at home. By planning my daughter’s school hours around my work hours, I can continue to homeschool her and give her the personal attention that helps her to thrive. “I’m glad that we can homeschool so that we can be together,” my 9-year-old daughter recently told me, as we cuddled on the couch together one morning. Above all else, homeschooling gave me the gift of time with my children as they were growing up. Beyond formal academic work, my children and I had the time to play games together, read books out loud, learn sign language, sew dresses for dolls, talk about spiritual things, kick a soccer ball, and feed our neighbor’s horses. As I look back over our 25 years of homeschooling, I can see that all those days we spent doing life together gave my children an excellent, practical education—and it laid the foundation for a strong, lasting relationship with each of them. And if you asked my family today, homeschooling would still be our first choice! If there isn’t a homeschool event scheduled for your area, please join us for one of Homeschool Now USA’s online homeschool information meetings. Seating is limited, so we encourage you to sign up today. Guest Post by Joyce Blankeship | Photo Credit: Photo from UnSplash, graphic design by Charity Klicka.